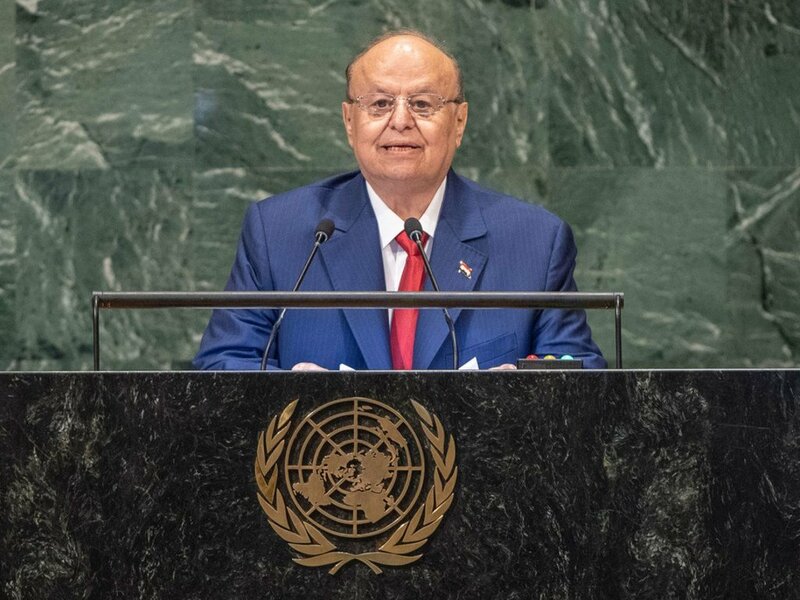 President Abdrabuh Mansour Hadi Mansour of the Republic of Yemen addresses the seventy-third session of the United Nations General Assembly. In his address, President Hadi explained that the challenges faced by his country is not a political crisis and cannot be contained by dialogue, urging international community to bring pressure on Iran so that it halts its intervention in Yemen. Yemen is fully ready for a sustainable peace based on national, regional and international terms of reference, he said, adding that it is not an advocate for war and vengeance. The State should be restored, and the coup ended, stated the President, underscoring that peace can only obtained by implementing the relevant international resolutions, including Security Council resolution 2216 (2015), which calls on the Huthis to withdraw and hand over their weapons. President Hadi also highlighted his Government’s efforts to protect civilians, especially women and children and said that it has instructed the country’s military not to recruit children as well as to rehabilitate those that have been detained while in the ranks of the rebels. Despite limited resources, Yemen continues to participate in the fight against terrorism and the Government will not step back from any measures that would counter the financing of terrorism and money laundering, he said. In conclusion, the President of Yemen thanked Saudi Arabia, applauding its key role in alleviating the humanitarian crisis in his country, and also added his thanks to humanitarian organizations in the Arab coalition countries and various UN bodies for their humanitarian assistance. Since 2015, fighting has been ongoing in Yemen between forces loyal to President Hadi supported by a Saudi-led coalition and Houthi rebels. Full statement (in Arabic) available here.